OpenRA had a very successful 2016: including two feature-packed releases, a map design contest that produced many great maps, and two seasons of the RA Global League which separated the wheat from the chaff across a grueling 544 battles. Our online player numbers have nearly doubled since this time last year, and it's now common to see more than 100 commanders on the battlefield at peak times each day. HiDPI font rendering for players with high resolution displays. Fixes for several multiplayer bugs that could stall or crash games when a player disconnects. The Red Alert "shell map" background is now muted. New behaviour for the Red Alert Gap Generator and Tiberian Dawn Obelisk. Fixes for asset installation on 32 bit operating systems and from the original RA95 CDs. 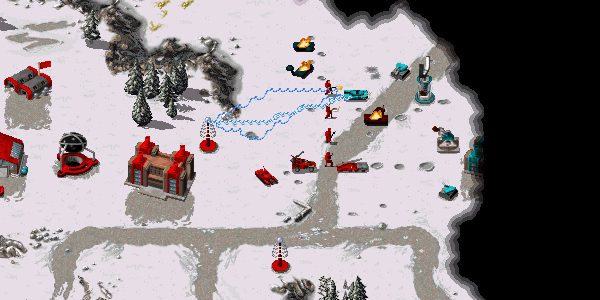 The Dune 2000 mod in particular has many changes to make it better match the gameplay and graphical polish of the original game, plus 7 new campaign missions. Check out the full changelog for more details, and head over to the download page to try it for yourself! Your feedback on these playtests is important, because they are the last chance to catch any serious bugs or undo any controversial balance changes before they are included in an official release. Red Alert Gap Generators now actively reduce enemy unit sight. Players with high resolution laptop or 4k displays will appreciate crisper font rendering. A new trait conditions system provides much better control over trait interactions. Actor vision has been overhauled, adding support for features like the RA active gap generators, D2K actors revealing themselves when attacking, and cliffs blocking vision in heightmap-enabled mods. Simplified weapon definitions using inherited yaml templates. Some initial steps towards removing code patterns that are not compatible with save game support. OpenRA grew out of the C&C modding community, and one of our major goals is to provide a flexible game engine that the community can use for their own projects. 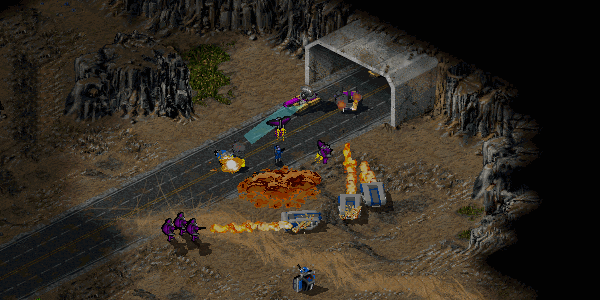 Unfortunately, this goal has been hurt by OpenRA's single-engine approach, meaning that every new release would unavoidably break community mods. After many discussions, we have developed a new mod support strategy that we will implement over the next two OpenRA releases. This playtest (and the subsequent final release) starts by adding support for parallel OpenRA installs, and we have started developing a mod template that includes instructions and scripts to simplify mod development and packaging. Mods built using this template will be self contained games that function independently from our official mod installs. 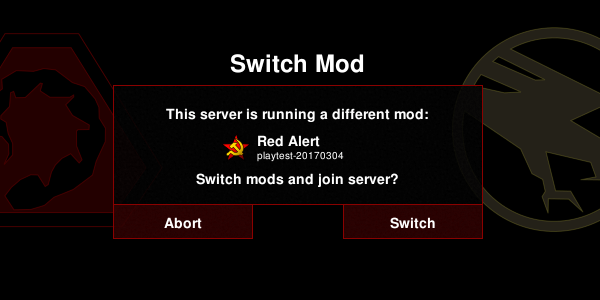 The in-game multiplayer server list will now list games for *all* the mods that a player has installed (even across multiple installations), and will allow players to directly switch to another mod when joining one. This applies across versions as well as mods, meaning that future OpenRA releases will be able to coexist, and switching between release and playtest servers will be just as easy as switching between RA and TD servers today. The multiplayer server list is now smarter about multiple OpenRA installations. The release after next (aiming for mid/late 2017) will complete the mod-support transition by removing the in-game mod chooser and support for manually installed mod packages: all mods (both official and community) will be listed individually with their own names and icons in your Start Menu / Dock / Launcher. This overlaps with our previously announced plan for a new project logo, and so we are delaying that change to this future release. The Tiberian Sun mod has made exciting progress over the last four months, with support being merged for bridges, tunnels, subterranean units, jumpjets, and bouncy grenades. Improvements to our terrain heightmap logic means that cliffs are finally able to block unit sight and projectiles. Progress continues on the Tiberian Sun mod. The end of our "core feature TODO" list for Tiberian Sun is now in sight, but there's still a fair amount of work to do before we can consider a public release. We expect to have more updates on this progress later in 2017. I've posted this manually because the moddb syncing bot doesn't appear to be working anymore. See our main news post or moddb article for additional discussions. wow, everything sounds great and the steady progress is amazing. I really have to find some time to give it some more tests.